New York (TADIAS) – On the evening of September 28th, 2009, Yadesa Bojia, an Ethiopian American artist based in Seattle, Washington, was babysitting his children at home while watching CNN when he recognized an image on the TV screen of one of his artworks. “That’s my design!” he exclaimed. He was looking at the new African Union flag created using a sketch that he had submitted for competition two years earlier. “By then I had almost forgotten about it because at that point I had not yet heard back from AU,” Yadesa (a.k.a. Yaddi) recalled in a recent interview with Tadias. 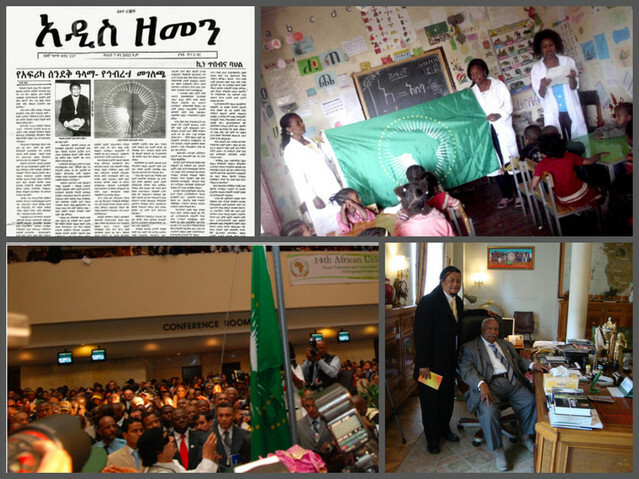 Yaddi spotted the flag on Lary King Live whose guest was Muammar Gaddafi, the Chairman of the African Union as well as the head of the African Union Commission (AUC) at the time. The Commission was tasked to come up with an updated insignia for the continental body, and the interview conducted at the Libyan Mission in New York showed Gaddafi flanked by the new banner. “I could not believe my eyes,” Yaddi said. 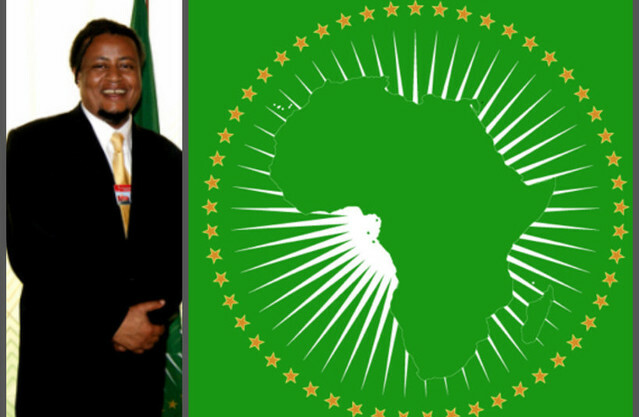 Yaddi says he continues to be proud of his contribution to AU and Ethiopia’s role over the past 50 years under starkly different successive regimes in keeping the organization alive. He is reminded of a forceful defense of this legacy by the late PM Meles Zenawi during his tenure as Prime Minister when there was a concerted effort to move the head office outside of Ethiopia. Indeed, it was 50 years ago this month that under the leadership of Emperor Haile Selassie 32 heads of state signed the founding charter to AU’s predecessor the Organization of African Unity (OAU). And to mark the occasion, Yaddi said, he has collaborated with his friend reggae musician Iré Taylor (Reginald Taylor) for a poetic and musical tribute. “I wanted to commemorate the Golden Jubilee by remembering those who worked hard to establish the OAU, leaders like Haile Selassie, and applaud the Union’s historic and unwavering stand against apartheid in South Africa, as well as the present economic promise of African Nations and the selection of the first woman chair,” he said. You can watch the video on You Tube here. The music is also available on iTunes, spotify, Amazon, and Zune.